For those of you up on dietary fads, you’ll recognize this as a “Paleo” diet. I prefer to use a slight variation on Paleo, called Primal by some, in which some amount of dairy is also OK. The food choices are almost entirely lean meats (fed their own natural diet, wherever possible), fish, eggs, vegetables, fruits, nuts, and seeds. Basically, anything which our Paleolithic ancestors could have conceivably hunted or gathered. (Which is why the dairy is considered questionable by some – really? A caveman chasing down paleolithic cattle to milk them? Hmmm…) I haven’t been 100% perfect all the time – corn syrup and corn starch and soybean oil are more pervasive than you realize, and the staff at the sushi buffet got REALLY mad when I just took the fish and left the rice. *whistles innocently* But I would say I’m in the 85% – 95% range of eating Primal-style. I’ve tried all sorts of “lifestyle” modifications before – Atkins, South Beach, Mediterranean, Vegetarian, blah, blah, blah. And I’ve come to the conclusion that (in America at least), what you eat is like Religion. Everybody pontificates about what is right, and what is wrong, and the dire consequences awaiting you if you make the wrong choice, or stray off the straight-and-narrow. So I will not be debating the pros and cons of Primal on this blog, nor waxing passionate about the virtues of Primal eating versus, well, anything else. What I will say is this: I can’t argue with results, and the reason I will stick with Primal eating for the rest of my life is because I didn’t realize how much I felt like crap all the time until I stopped feeling like crap all the time. Heartburn, gross burps, indigestion, bloating, overeating / binging, joint pain, and trouble sleeping – all have improved significantly or cleared up entirely since I stopped eating grains and legumes. To celebrate, I here present for you the capstone of my attempts at sourdough bread. My taste testing audience told me this was the best loaf I had ever made. Cover with foil, and let sit in a warm-ish location. I used my over-the-stove microwave, with the light below it turned on. This gives the yeasties a little more food, making the final bread lighter and more airy. Re-cover and stick back in its warm spot. Mix this into the dough, which will be pretty stiff by this time. Pour it all out onto a well-floured surface, put more flour on your hands, and gently fold to make sure all the flour is incorporated. This part is more art than science, btw! If your original starter was runnier or stiffer, you may need more or less flour at this stage. 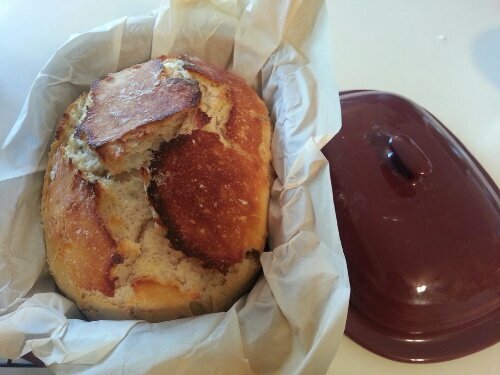 If you are using a Pampered Chef Deep Covered Baker, line it with parchment paper. Put the dough in it and cover – this is the final proofing stage. If you don’t have a DCB, you can put the dough somewhere else to proof, just make sure to handle it gently and cover it so it doesn’t dry out. About 2 hours later, preheat the oven to 425 F. If you are using the DCB do NOT preheat it – this voids your warranty. If you are using a dutch oven, OTOH, put it in the oven to preheat too. After the oven is nice and hot, add the dough in the covered DCB (or add the dough to the dutch oven, and cover). If desired, you could score the top of the dough with a serrated nice for prettier patterns on the top. Bake for 35 minutes with the lid on. Remove the lid and let bake an additional 15 minutes (or so) to get a nice brown on top. Remove the bread from the DCB, and let cool COMPLETELY on a baker’s rack. The cooling is actually an important part of the baking process, so don’t rush this part. Categories: Cooking, Health | Tags: Recipes | Permalink. Just to make sure I understand, you can no longer eat this bread, right? Since grain isn’t paleo? I’m happy to report I never experience the badness you describe so my diet must be working OK for me! Yes, that’s correct. That’s why I’m sharing the recipe now – so it doesn’t get lost from all memory, since I worked so long and hard to get the recipe right in the first place! I don’t know why I didn’t think of this first, but beer is also not primal, right? Beer has to have either barley or wheat, as far as I know. Wine is primal I guess so my wife would be OK with the primal concept.